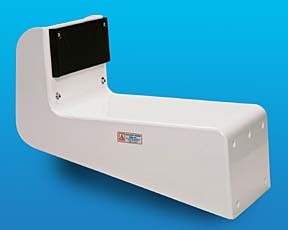 Add a convenient outboard motor bracket to the transom of your boat. Excellent for mounting auxiliary "kicker" engines. Allows for easy engine tilting. Model 4100 High Thrust Outboard Motor Bracket for Motors with or without Power Tilt Option. Designed for maximum 9.9 HP high thrust four stroke outboard motors, maximum weight 140 lbs. Suitable for 2 cycle outboard motors up to 20 HP maximum and 140 lbs. Electrostatically powder coated in white. 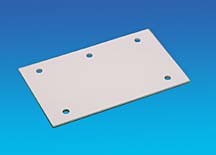 Polypropylene mounting pads, all fasteners stainless steel. The build-in tilting device of the outboard motor is used to tilt the outboard "back" and clear the skeg from water. No parts to wear out, easy operation, easy to install. 21 1/2 " long, 12 1/2 " wide, 17" transom to center mounting pad. Transom mounting flange 12 1/2" by 8" high. Shipping weight 21 lb 8 oz. Get it with Reinforcement Plates - Model 4100REP for added support for just $42 more.